What great advice for all of us. We have the power to change the world by simply taking advantage of those tiny and seemingly insignificant opportunities to do the right thing in the right way. Motivated by love, we can end hunger in our lifetime, but we can also do so much more, as well. 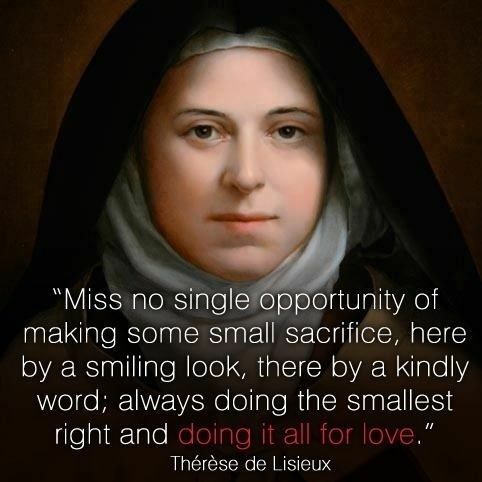 This entry was posted in Hunger & Poverty, Quotes, Spirituality & Religious Writings, Uncategorized and tagged faithfulness, hunger, kind word, love, opportunity, sacrifice, smile, spirituality, Therese of Lisieux on September 24, 2015 by Ray Buchanan.